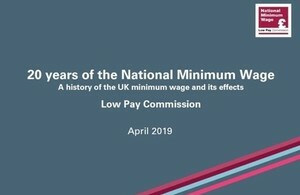 Read the Low Pay Commission’s new report ’20 years of the National Minimum Wage’ here. All the data used in the report is published alongside it. £2.70 is the difference between the 2018 earnings of the lowest paid first percentile of jobs held by workers aged 25 and over, and the amount they would have been paid if their wages had grown as fast as jobs in the middle half of the hourly pay distribution. This is multiplied by 36 hours a week, and 52.14 weeks a year to give £5,000. The bottom 30% of workers aged 25 and over have seen faster wage growth than the 31-80th percentiles, which we ascribe to the NMW/NLW. £60bn is calculated by working out the difference between two figures: first, the sum of the real increases in hourly pay since 1999 for the bottom 30% of jobs held by workers aged over 25; second, an estimate of what they would have earned in the absence of the minimum wage. (We assume a counterfactual growth equal to the middle half of the hourly pay distribution). We then multiply this figure by the total number of hours worked by these employees. The National Minimum Wage was introduced on 1 April 1999, and originally applied to workers aged 22 and over. The National Living Wage is the statutory minimum wage for workers aged 25 and over. It was introduced in April 2016 and has a target of 60% of median earnings by 2020, subject to sustained economic growth. The most recent forecasts imply a projected rate of £8.67 in 2020. On 1 April 2019 the National Living Wage and National Minimum Wage rates all increased. See the table below for rates. The Low Pay Commission is an independent body made up of employers, trade unions and experts whose role is to advise the Government on the minimum wage. It was established in 1997 and delivered its first recommendations in 1998, which were implemented the following April. The recommendations of the Low Pay Commission have always been unanimously agreed by Commissioners. The fact that these judgements are made by social partners, working together and reaching decisions via consensus, ensures that the concerns of both workers and employers are taken into account and that all recommendations are backed by both groups alike.